Here's a collection of questions related to honey bee and beekeeping that visitors of Benefits of Honey have asked via the Just Ask Page. Check out if these answer your most pressing questions. Reply: It's a combination of factors but the use of chemical pesticides and herbicides seems to have the greatest impact on the wellbeing of bees. You may be interested to read: Did Albert Einstein Ever Link Doom of Human Race to Bees? Question: Do I need to remove the old queen before replacing her with a new one? Reply: Yes, you need to remove the old queen before installing a new one. This is to ensure that the hive/bees know that they are queenless. Reply: Bees will eat practically any sweet liquids, including grape jelly, especially when there is a lack of floral sources nearby. But we don't think grape jelly is the best thing for bees. The sugar composition is very different from pure honey, so feeding them too much with it can cause them stomach issues. 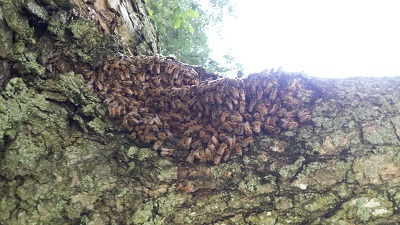 Question: I have a hive of bees in a large tree in the back yard. They have been here for several years. This year they appear to be chewing away at the tree by the opening into the hive. Is this an indication that the bees need something in their diet or just making the opening to the hive larger. The bees are very friendly and I want to keep them around. They are busy day and night. 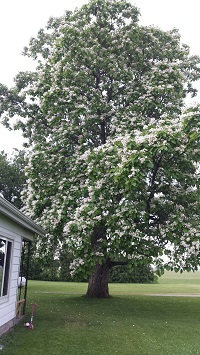 The actual opening is at the top of the branch where it meets the main trunk of the tree. They are chewing an area about 6 inches wide and 8 to 10 inches long as shown in pictures below. Reply: Very interesting phenomenon. Yes, they are probably enlarging their hive opening, because honeybees do not chew or eat wood. But others might have a different perspective on this. Question: We are in the middle of winter and my hive just died off completely We have had some -6C nights here recently and the deaths almost appear to have happened in the last couple of days. What temperatures can they endure in a hive in a paddock? We were late putting in their winter feed, could that be the reason? There is no sign of disease or other insects in the hive. Reply: Your bees seem to have died of hypothermia. They can't survive when their body temperatures are lowered to about 7 degrees C. Bees don't like getting cold. Their hives may have to be better insulated and protected by a heater in harsh winters. With a sufficient energy source from the food they have stored, bees can keep themselves warm by clustering and huddling even when the outside temperature drops to below zero degrees C.
Question: All the bees in my hive died around mid December. We had several days of sub-zero weather and the hive was on my roof without any extra protection (a mistake I won't make again). When I cleaned out all the dead bees in late March, It appears that I have nearly a dozen full frames of honey. I plan on 2 hives this year. Can I reuse the honey-laden frames for the bees this year? Reply: You will need to clean up the frames and make sure the cells and honey are free of dead bees and mold. Also make sure the bees didn't die of any disease as you don't want to take any chance of passing on anything that killed the bees. Otherwise, the honey can be used for feeding your new bees. Question: Honey bees have been on our bird feeder for days. Can they eat bird seeds? Reply: Yes, we have heard of bees on bird feeders too. Bees don't eat bird seeds, what they are after is the pollen-like substances on the seeds, which many have guessed to be a mix of pollen and dust. Perhaps that was the best the bees could find to carry back to their hives then. Question: Why do bees fly with their legs pointing down and wasps fly with their legs up under their body? Reply: Bees sometimes use their huge hind legs to fly faster. By pointing their legs down, it actually helps them create an angle in the air to move faster. It doesn't sound logical because this action seems to do the reverse, ie slow down by creating a drag in the air with their legs down. But bees do it different! Question: What happens if honey is never taken from a hive? Reply: The bees will do just fine. They will keep all of their honey. The hive can exist for their own sake and still have a long and productive life. Question: How do bees keep busy? Reply: The honey bees are kept busy with their different roles and responsibilities in the hive. Read: Awesome Roles of Bees in a Hive. Question: What causes bees to sting people? Is it the smell of perfume or lotion, or is it the natural "sweet" scent of human skin? Reply: There are many reasons why bees are attracted to certain people and one of them could be due to certain smell from the person being detected. However, bees only sting when they sense danger and in defense of themselves or their colony members, and this commonly happens people start to fan off or sweep off the bees that go close to them. Question: I'm helping with an elementary school service club (2nd through 5th grade) and we would love to do a service project that would benefit bees. Do you have any suggestions for projects? -- the social community of bees, how the honeybees work as a team, they have specific roles. -- why bees are dying, the Colony Collapse Disorder. -- starting a beekeeping club in school or starting beekeeping as a hobby. -- love the bees, educating the community about bees, why they are important creatures to us and the environment, which bee-friendly flowers to plant. Question: What happens if a bee is in the rain? Question: How many bees does it take to make 1 kg of honey? Reply: The average worker bee produces about 1/12th teaspoon of honey (which is about 5g of honey) in her lifetime. This means to produce 1kg of honey, approximately 200 bees would be required. Question: What do bees do in the winter? Reply: During winter, bees stay inside their hives and huddle as a tight cluster to keep themselves warm. They depend on the honey collected during the warmer months as food and source of energy and warm. So, it is important they collect enough honey before winter arrives. Question: Do bees sting only when they sense danger? 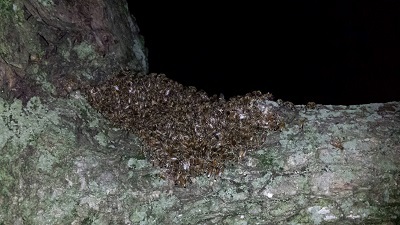 Reply: While bees usually sting only when they sense danger and in defense of themselves or their colony members (especially when people try to off or sweep them off), they may also attack for many other reasons related to bad weather, noise, color, hunger and thirst issues, or a certain smell (eg sweat, chemical attractants such as hair shampoo, soaps…) from people. Like humans, certain bees, regardless of their species, can be temperamental, cranky and irritable. Question: Why are thousands of bees sitting quietly in the front of their hive? Reply: This sounds like bearding, whereby bees quietly hang out at the entrance of the hive to keep themselves cool during a hot weather. The bees may be facing an overcrowding issue and fanning with their wings to keep the temperature in the hive down isn't enough. You may want to ensure that there is a nearby water source for the bees and that there aren't any congestion or ventilation problems in the hive. Question: What happens if the bees run out of honey during winter? Reply:The survival of the honey bees during winter depends on how much food (ie honey) they have stored. They feed on honey for energy so that they can generate heat within the hive. If the colony runs out of honey before spring, they will freeze to death. For survival reasons, during winter, the drones are often driven out of the hive by the worker bees and left to die. Some beekeepers feed honey or sugar syrup to the colony when the bees do not have enough food during winter. Question: How many honeybees are needed to make 1/2 teaspoon of honey? Reply: It takes about 10000 worker bees to gather one pound of honey. So, calculating based on this, it will take about 180 bees to make half teaspoon of honey. (Assuming half teaspoon is about 2.5ml). Honey is too precious, isn't it? Question: How are bees endangered? Did Albert Einstein Ever Link Doom of Human Race to Bees? Question: Do honey bees pollinate corn? Reply: Bees do visit corn and collect its pollen. But corn is mostly pollinated by wind. Question: How long will a bee live if it can't get into its hive? And how long can a bee hive live after being sealed off? Reply: It's unlikely that the bee would be accepted into a new community. The lifespan of a honeybee is only a few weeks, and shorter if the bee is unable to find food to feed itself. And if it's a drone, it cannot survive outside the hive; it's not equipped to find food. The bees will continue to live off their stores in the sealed hive, so it depends on how much food is available in the hive. Question: Is it true that honey is bee vomit? Reply: No. Honey is stored in bee's "honey stomach" which is separate from its digestion stomach. Get more details and an image of the bee's honey stomach in Is Honey Bee Vomit? Question: Do bees poop in the honey they make? I suppose their droppings don't smell since all they eat is honey and pollen? Reply: No. I learned from beekeepers that they defecate outside the nest (if they are mature enough to fly), or they do it well away from the combs on a surface that is suitable. Sometimes, they even get sick with dysentary in the winter time, from trying to hold it until there is a day suitable for a cleansing flight. More in Do Bees Poop in Their Honey? No, you are wrong, bees' droppings do smell. Question: What do honey bees use to make the bee hive? Reply: The internal structure of a bee hive is made of wax, a liquid secreted from the underside of the worker bees' abdomens. And the bees use their legs to shape this wax into the hexagonal cells of honeycomb. Commercially, beekeepers provide modern frames for bees to build their beehives. In the more natural habitat (now very rare), bees make the external covering out of straws, plant parts, and mud: How do bees make honey? Question: Is it true that the government is using bees to sniff out bombs? Reply: Yes, it's true. Honeybees have an amazing sense of smell. You can get the details here: Honeybees are Ultimate Bomb Detectors! Question: Is eating the actual honey comb inside a jar of honey good for you? I bought a jar of fresh honey with the comb inside with the honey. The gentleman that sold it to me said that the by eating a little piece of the comb every day has more benefits. Is this true? Reply: The biggest advantage of eating honey with the comb is -- you can be 100% sure you are eating unprocessed, raw honey that will give you the most health benefits because of all the live enzymes. The wax is not that great-tasting but some people like to chew it like a gum and eat it as a roughage to improve bowel system. Question: In the collection of honey from the bee hives, is the health of the colony compromised? In other words, by taking their food source don't the bees die? Reply: Professional beekeepers would not compromise the health of their bees. They are businessmen too. They depend on these creatures to give them honey on a continuous basis. Thus they have to be very careful not to hurt them and will always leave enough honey for their food. They make conscious effort to watch them all the time to ensure they're okay. Good beekeepers set out to keep a friendly long term relationship with their bees so that they have enough honey to sell as a result. Their job is to see that they are content. Question: What are the by-products in honey production? Do you know anything about colony collapse disease? I am concerned! Reply: In 2008 April, I wrote a small article on the colony collapse disease and inform our readers via the BuzZStop newsletter: Did Albert Einstein Ever Link Doom of Human Race to Bees? Personally, I still find this disease quite mysterious, as it's peculiar to only certain countries. Regions like Africa or Asia are still reporting an abundant and healthy production of honey. Even more interestingly, recently, there is a report on the global rise in the number of bees: Honey & Health E-News . Good news! 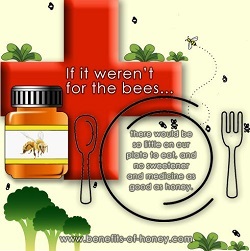 Question: What is the benefit of eating queen bee's honey? End of "Bee & Beekeeping Q&A". Back to "Got a Question? Just Ask! ".